The Peterborough & District AA members match on the High Bank on Gunwade Lake at Ferry Meadows saw plenty of fish willing to feed despite a strong wind not helping the anglers. Clive Cole took the honours from peg 29 with 23lb 10oz of bream, skimmers and a tench. 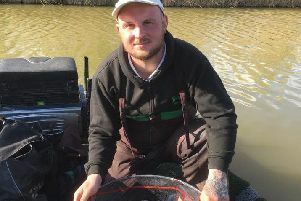 Mel Saggers with 16lb 8oz including three bream from peg 31 came second, and then came Paul Dotchin on peg 42 with two bream plus a couple of small fish for 8lb 7oz. Sport was much better for those in the Steel City Open match at Ferry Meadows. They were on the opposite bank to Peterborough and seem to have enjoyed much better sport. Winner Shane Hodgkinson put a massive 127lb 13oz to the scales, all taken on long range feeder tactics. Then came Dave Lawrence with 124lb 14oz, followed by city rod Paul Rayner with 78lb 9oz. Match results from Haddon Lodge were once again disappointing at the weekend. Joint top with a modest 21lb 7oz were Lucio Melillo and Martin Harwood. Frank Bevilacqua took third place with 18lb 7oz, followed by Cliff Fuller on 13lb 8oz.